Thankfully I can rest easy, because The House Of Him is not shite. Far from it, in fact. Anyway, enough of that pre-amble pish and onto the review itself. 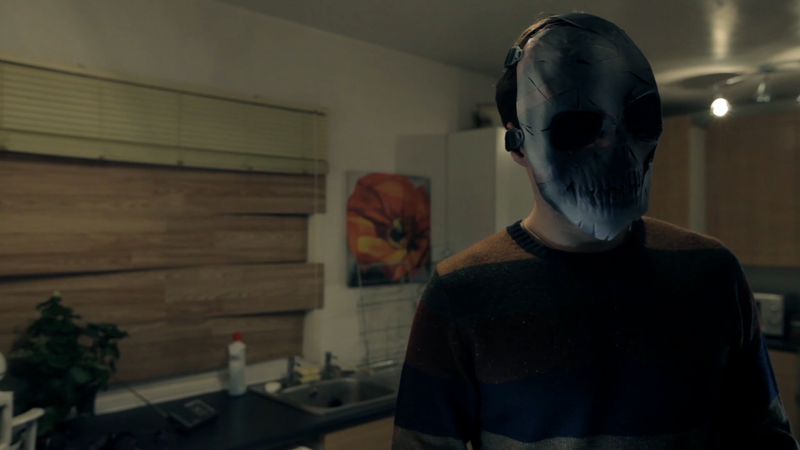 The House Of Him focuses on Anna, a young woman who’s found herself in a house inhabited by ‘Him’, a masked misogynist with a penchant for killing. Only a wee while earlier, the killer had offed lady number 26, Anna’s pal Sophie, so when Anna enters the house her mate’s lifeless corpse is still sitting on the kitchen floor. The front door is locked and Anna’s fate seems inevitable, but the killer isn’t going to kill her just yet. He plans to, don’t get me wrong, but something else is on his mind. According to the radio, some odd shite is going down in houses around Britain, something that’s causing the houses to ‘go bad’. The killer is adamant that he and Anna are not going outside, but he also can’t help noticing that all is not well in the world. That’s all you’re getting plot-wise from me. 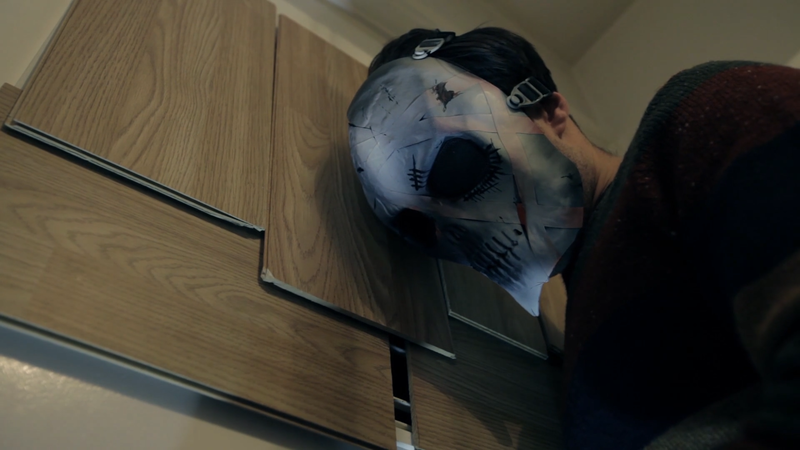 The House Of Him is not a standard slasher or what have you: it’s one of those films where the less you know, the better. 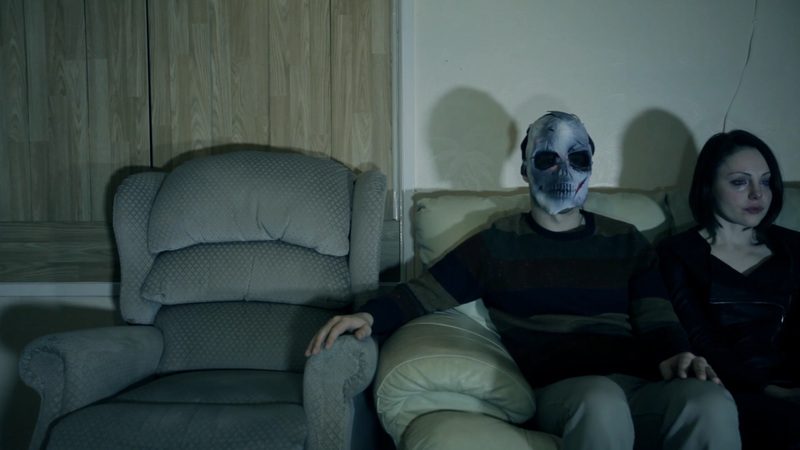 Shot on a micro budget of less than £1000, this is a film that looks far better than movies that cost many times more to make, particularly during the final act where things take a turn for the surreal and it all starts to get a bit J-horror. It sounds incredible too, with a score composed by Iain Cook from Chvrches. As is the Chvrches style, it’s a very electronic score, giving a brilliant ’80s vibe reminiscent of the likes of Halloween 4 and 5 or, if you’re after a more recent comparison, parts of Drive. It’s also helped along with outstanding performances from the cast, particularly the two leads. Louise Stewart is brilliant as Anna, expertly walking that delicate balance between distraught victim and defiant fighter. Richard Rankin, meanwhile makes Him an interesting antagonist, one who’s clearly unhinged but also gives a real feeling of normalcy. He may wear a mask but this is no zombified Crystal Lake slasher or invincible Haddonfield strangler, he could well be the guy living next door to you. And it’s this which is the underlying message of The House Of Him. Though the film never explicitly draws the parallels it wants you to recognise while watching, it’s clear that despite the paranormal goings-on in this house, they’re reflecting very normal, horrible things that happen in households up and down the country. It’s no coincidence that Stewart’s later discussion with a hazmat-clad stranger, in which she explains that she could in reality have left any time she wanted to but chose not to, will hit close to home for some viewers. 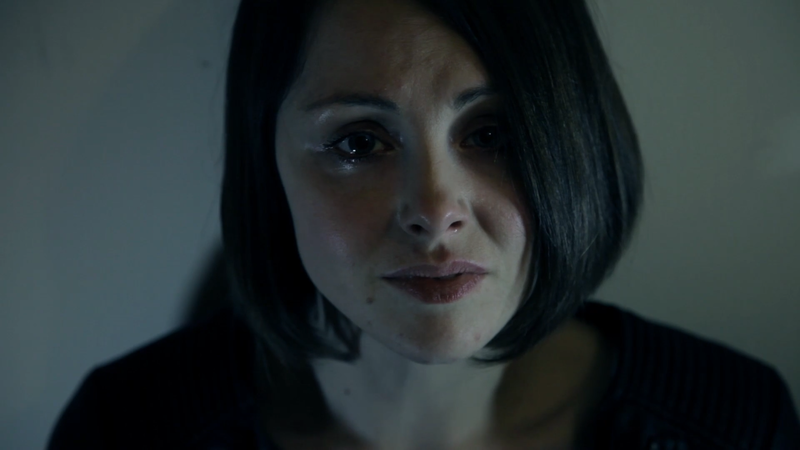 And it’s no coincidence that 10% of all profits made from the film will go to women’s aid charities. The House Of Him is a brilliant film. A lot of it, particularly near the end, gets a little abstract and ambiguous, so if you’re expecting a film that neatly wraps everything up at the end and explains everything that was going on you may be left scratching your head. But this isn’t trying to be I Know What You Did Last Summer or anything like that. It’s supposed to be someone’s nightmare, a series of horrific events that may not blatantly spell out the message but will still have a deep impact on those who watch it. Its message is that the real horrors in life don’t always take place in war-torn streets, or dark forests, but sometimes inside our own homes. It makes for uncomfortable viewing at times, but I can comfortably recommend it to everyone. Besides, on a purely biased note, it’s refreshing to see a horror film which almost entirely consists of Scottish accents (radio announcer aside). Real Scottish accents, none of this Wicker Man pish. Finally, special mention must go to Hope Florence, Rab’s daughter, who stars in the film and is my new favourite ‘creepy kid’ in a horror film, knocking Gage Creed from Pet Sematary down to second place. Sorry wee man, there’s a new champ in town. The House Of Him’s rating earns it a place in the hallowed That Was A Bit Mental Hall Of Fame. Click here to see which other films have made the grade. 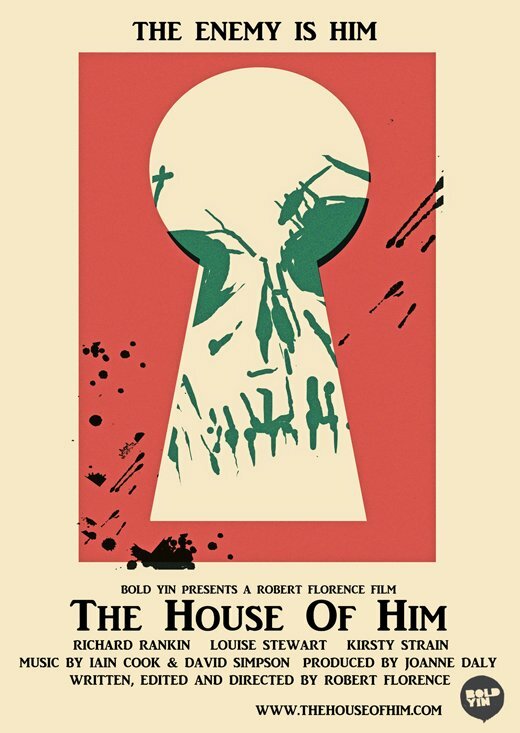 At the moment, The House Of Him can only be found on Vimeo, where it can be rented for $4.99 and bought for $12.99. As I said above, 10% of your cash will go to women’s aid charities.